ACE commissioned research report with the aim of improving ACE's understanding of disabled people's experience in the arts and cultural workforce; and identifying actions to reduce barriers. 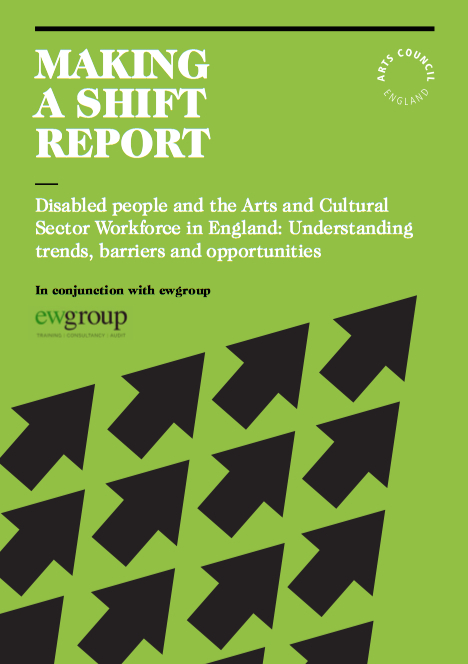 Monitoring data suggests that disabled people are significantly under-represented in the Arts Council-funded workforce. Just 4% of staff in National Portfolio Organisations and Major Partner Museums self-define as disabled (ACE 2016). This primary research suggests significant and varied barriers to entering the workforce for people with disabilities, and makes 12 recommendations, including to enable progression/promotion once in the workforce. An informative and useful read for employers, and those with disabilities within the sector.